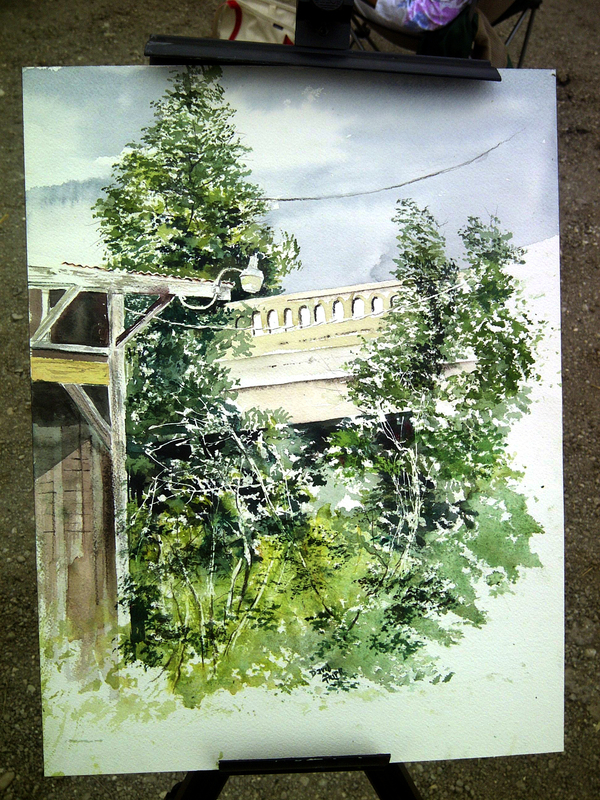 This was a week in which I found difficulty getting on track watercoloring en plein air. 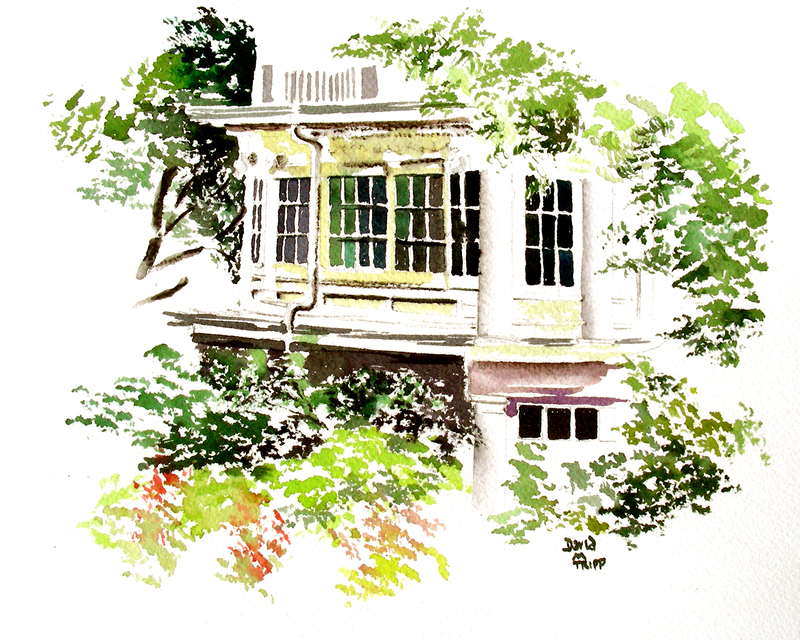 I dashed 40 minutes to Waxahachie every day after school, but encountered hot, humid weather in the upper 90’s and found myself without any energy or enthusiasm to paint. Last night, north Texas got blasted all night long by vicious thunderstorms. I finished my school finals by 10:30, and stepped outside to an amazing 68-degree overcast day. 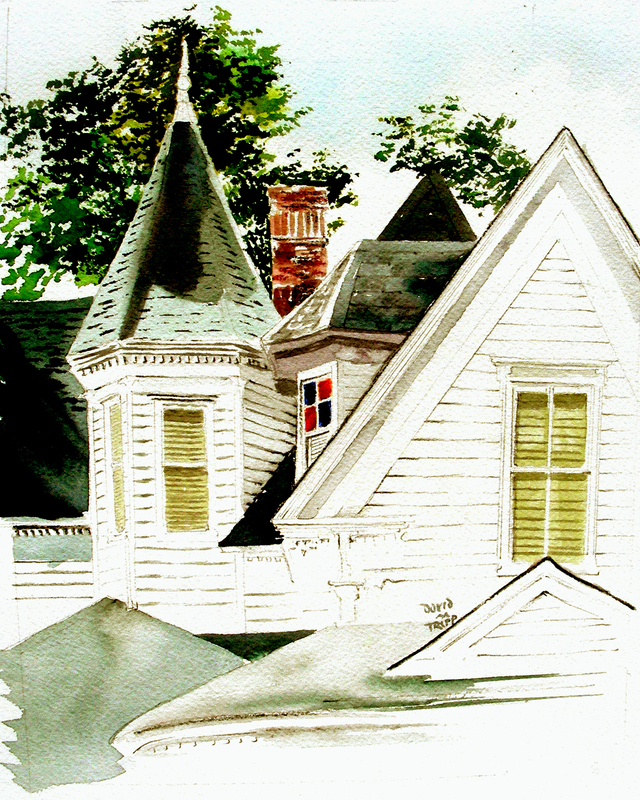 This is the first home I painted, in the 900 block of West Main Street. I kept all my sizes small today (8 x 10″) and as simple as possible. 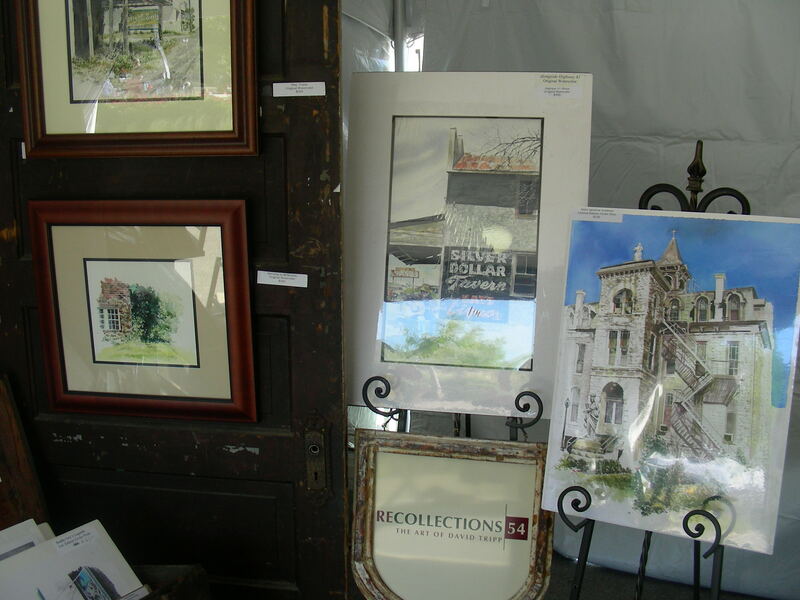 We are allowed to compete in the Paint Historic Waxahachie event with as many as five paintings, and as of today, I only had two. Today would be my last day, since tomorrow’s deadline of 2:00 will pass with my still being in school for a meaningless Teacher Work Day (today was the last day for the students). I have been working with an altered palette of late, and found real dynamics in Winsor & Newton Transparent Yellow. I mixed it with Winsor Blue (Red Shade) and got some amazing light green foliage variations. After completing the first watercolor rather quickly, I returned my attention to this sketch of 902 West Main Street in Waxahachie. I had drawn this out in pencil two days ago, then lost the sunlight that had made the facade so striking. Yesterday I tried to begin painting on it, but made several bad decisions, and decided to lay it aside awhile longer. Today, having warmed up with the painting across the street, I felt ready for this one, and tried to render it many ways similar to Edward Hopper’s watercolor of the Methodist Church in Provincetown. I did manager to pull off a few of the techniques, particularly combining pencil work with transparent watercolor washes. Again I found the Transparent Yellow pigment to work very well in coloring the blinds in the windows of this historic house. After matting and hanging the first two watercolors in the Ellis County Art Association, I journeyed back up Main Street, trying to decide on a house with American flags displayed. Since Memorial Day, Waxahachie has had flags fluttering everywhere. I finally selected this house that had about a dozen flags planted on the front lawn. 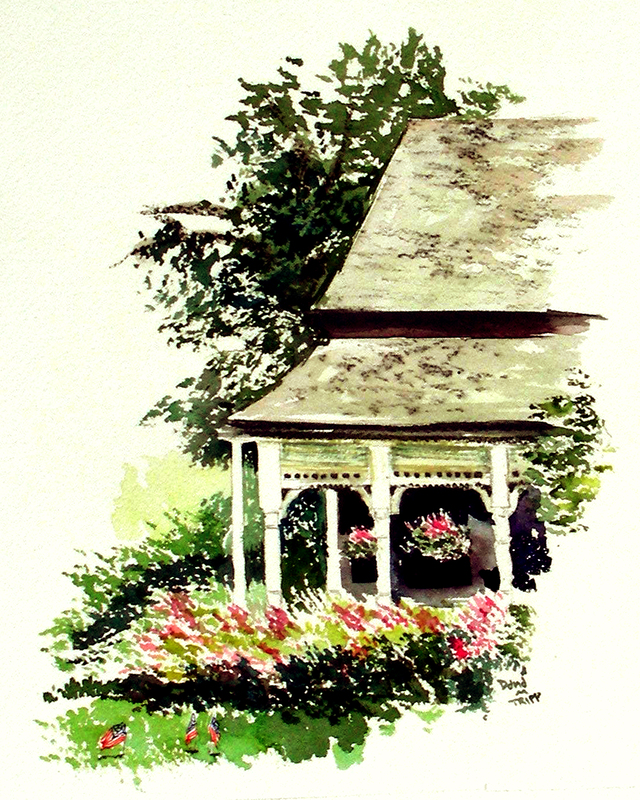 I was struck by beauty of the porch pillars and hanging baskets at this house, so I thought I would try a quick plein air sketch of just a portion of it, again staying with the 8 x 10″ size. This is the smallest of my compositions, as I tried to work very quickly and bring it to completion. 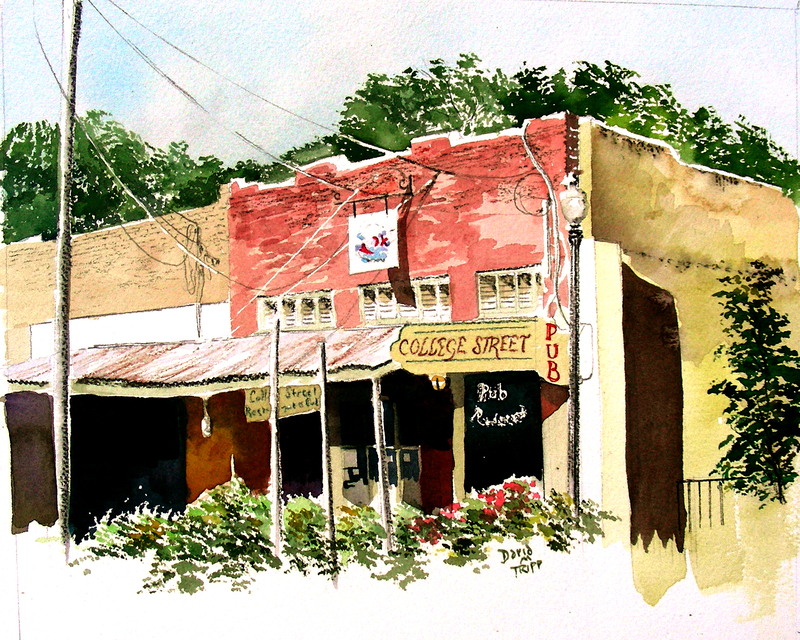 And finally, the College Street Pub, one of my favorite haunts in the city of Waxahachie. 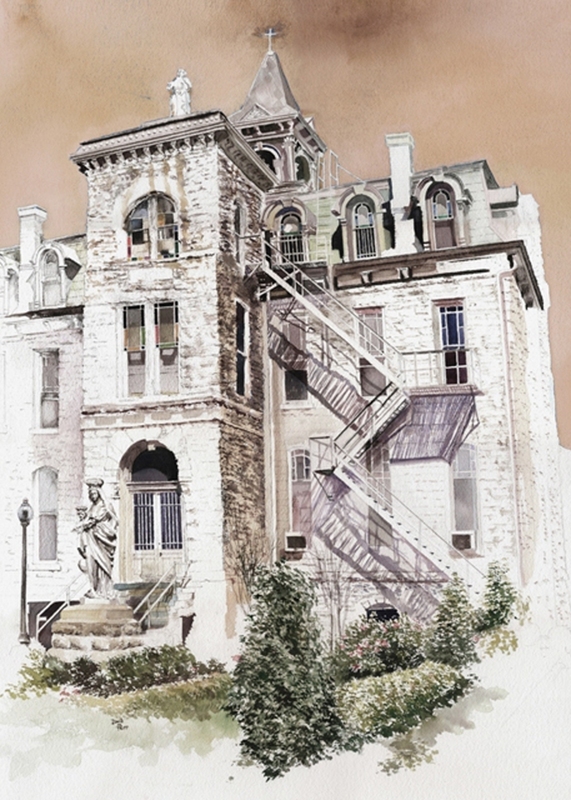 I drew out this composition with an HB pencil two days ago, right after the house on 902 W. Main. But I was weak with fatigue, and the sun was extremely hot that afternoon. Today’s 68-degree temperature was ideal for painting outdoors. I loved the details on this building–the signage, the electrical wiring, the light and shadows–all of it appeared rustic to me, and I just had to paint it. I began work on it just before 4:00, and knowing the Ellis County Art Association office would close at 4:00, I saw no reason to rush this. I will make a quick dash to the office tomorrow before the 2:00 deadline. Once this painting was finished, I realized that I had not had food since about 10:30 this morning. I had drunk plenty of bottles of water, but had had no food intake between 10:30 and 6:15. So, I decided it was time to re-visit the College Street Pub to enjoy some food and beverage and to salute a successful day. The last time I painted four watercolors in one day was during a paint-out competition in McKinney, Texas. That was several years ago. I’m thrilled that today I rose to the challenge. Today I felt an energy that has been rare of late. I’m grateful for the experience. Now, it’s time for bed. Hello from night two of the festival! Crowds are starting to build, and the music is getting louder, so I’m going to make this quick. I’m glad to see patrons filling the booths already. 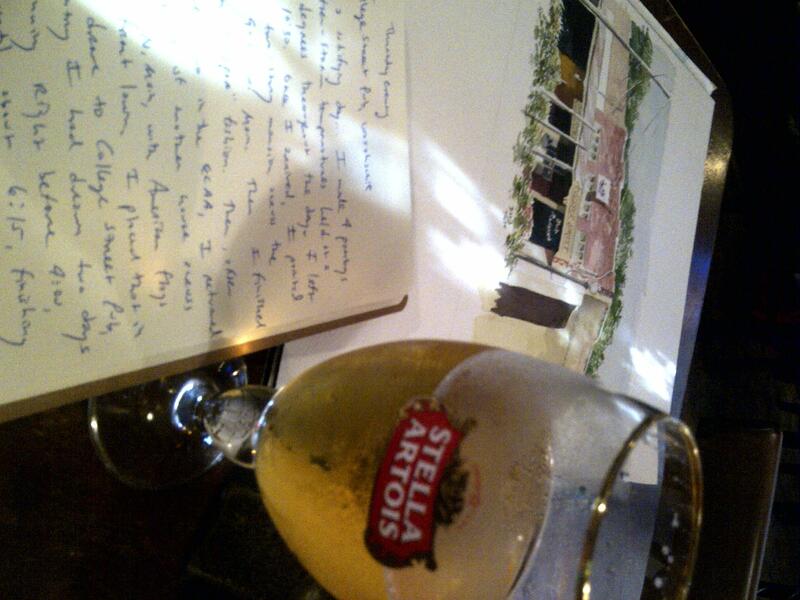 I’m somewhat fatigued with the double-duty: Waxahachie painting by day and Arlington festival sitting by night. The first day of the paint-out was quite good, and I sold my first painting this morning. I’m looking even more forward to tomorrow’s activity. Tonight, the Levitt Pavilion will feature Ray Wylie Hubbard. The green is already packed with people in their lawn chairs and on their spread blankets. It also appears that more art is being purchased today than yesterday. That makes all of us happy. I would love to see you at the Levitt tonight or tomorrow night, if you’re in the area. Thanks always for reading. The “Paint Historic Waxahachie” commenced this morning at 8:30 with a Quick Draw competition. 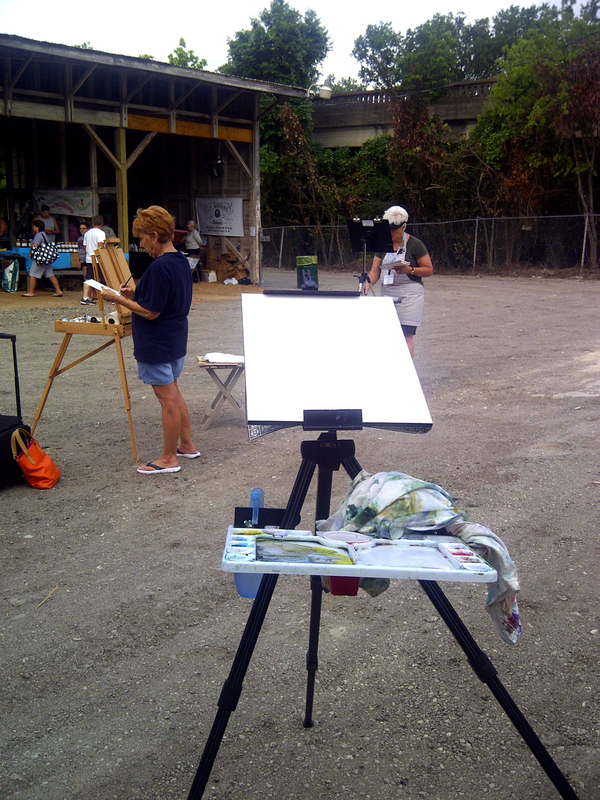 More than twenty of us set up our easels around the Farmer’s Market south of the square on Rogers Street, and had to paint something en plein air in two hours’ time. Then the paintings were silent auctioned until noon. I struggled first to decide on what to paint, and then on the actual painting of it (as usual). I ran into some trouble with my watercolor getting too wet and soggy, and I was afraid at the end of two hours that I was not going to be able to peel away the masking fluid I had used to highlight tree trunks and limbs. But, it turned out all right. Happily, the painting sold, so it now has a home. Here is a picture of it, still on the easel, just as I finished it. The painting measured 16 x 12″. I’ve returned to the house to do some quick business for my festival booth tonight, and to organize and pack some food for the event. I will be at the Arlington Levitt Pavilion from 4:30-10:30 again this evening. Music will be brought by Ray Wylie Hubbard. Thousands of people packed the place last night to hear Michael Martin Murphey. We expect enormous crowds again tonight (and hopefully a substantial number of art patrons). Greetings from the Levitt Pavilion in Arlington! I’m very pleased to find Internet access here at the Levitt Pavilion festival! It was a hot afternoon for setting up, but the booths were provided, along with some globe lighting. They gave me permission to install my own track lighting as well, and invited me to take over the space in the booth behind me that did not rent. So . . . I have 10 x 20 feet to work with, plenty of area space, and excellent storage in the rear. We are set up on a street that has been closed, the asphalt is level, and the two area rugs I laid down have nicely covered all the heavy cables that were run to provide electricity from nearby generators. 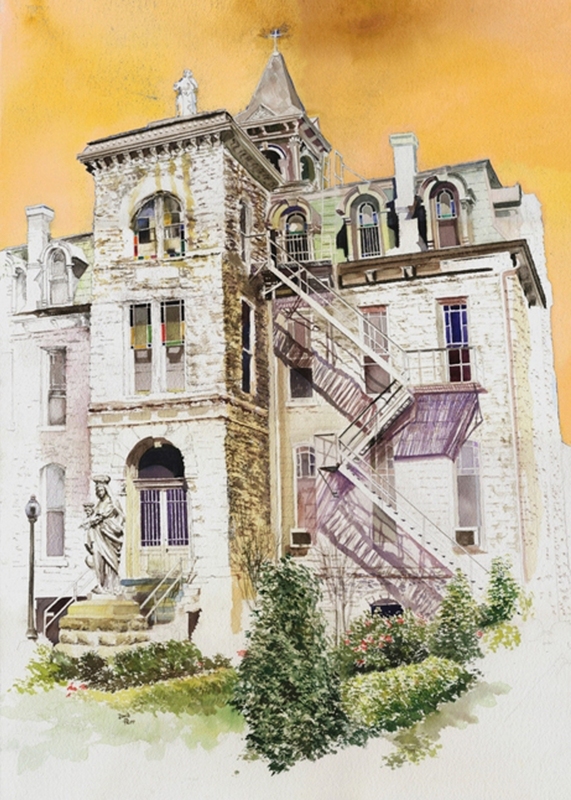 I’m very pleased to bring out about a dozen watercolors that have not been made public before, along with several limited edition and special edition giclee prints. Dozens of new greeting cards have also been processed, many of them reproductions of work I have not yet put before the public. Tonight’s music features Michael Martin Murphey. When he sings “Wildfire,” I’ll get chills–my band played “Wildfire” at the very first gig we ever did. I’ll never forget that night, and what joy it brought to me (though we were scared half to death). “Wildfire” was one of our best songs. So . . . I’ll be looking forward to that song later tonight, and will re-live the memories with gratitude. Festivals are fun. I’m glad the Texas temperatures are slowly dropping, the breezes are picking up, the crowds are gathering, and I’m feeling pretty serene. I’m looking forward to this weekend. I am bringing this watercolor back out into public view after a brief hiatus. 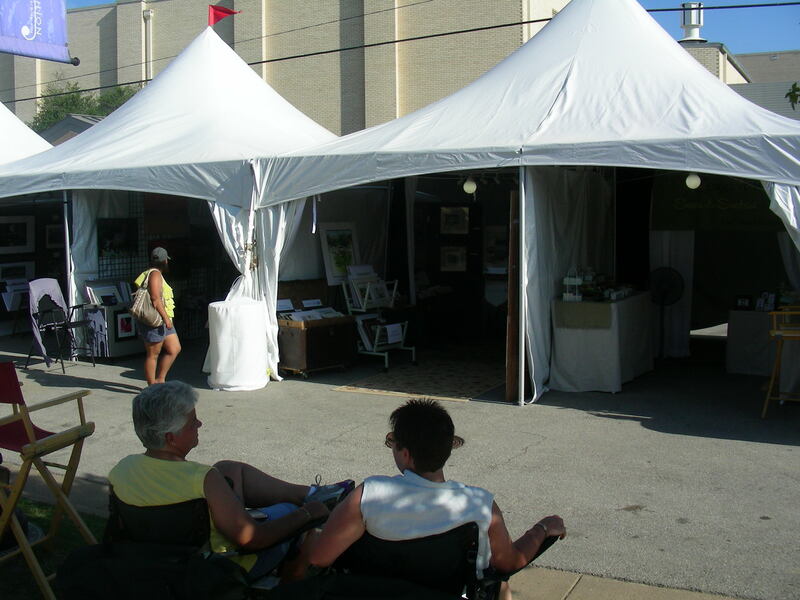 The art festival at the Levitt Pavilion in Arlington, Texas begins at 4:30 this afternoon, and will continue nightly through Sunday. I drove my Jeep to school, fully loaded, and will leave directly for the festival grounds once I get out of school today. I am ready and anxious for another festival after being out of the circuit for over a month. This weekend promises to be interesting: the ten-day Paint Historic Waxahachie officially opens Saturday morning, so I will journey to Waxahachie to take part in the two-hour “Quick Draw” competition, two blocks south of the town square at the feed store and historic railroad depots. 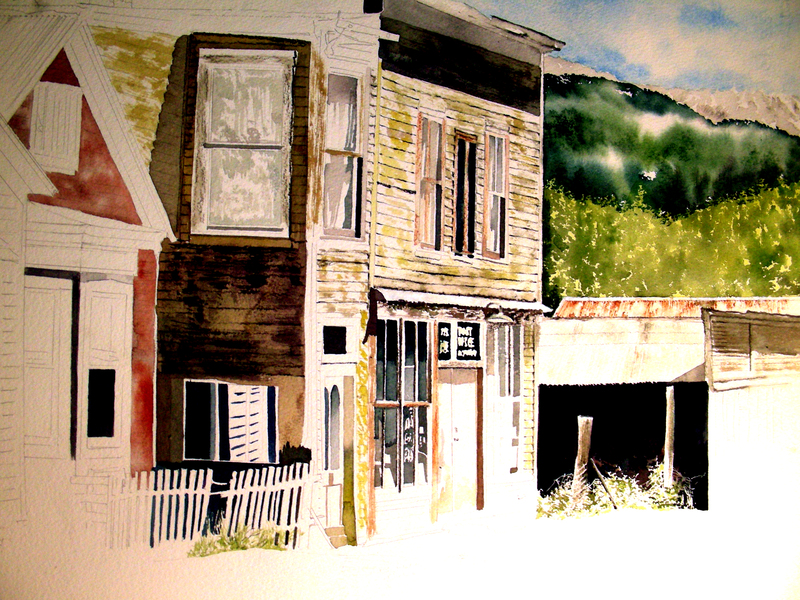 Around noon, I will begin my second plein air watercolor of some scenic site in that quaint town. Then, by 4:30, I’ll be back in my Arlington booth for the second evening of the Levitt Pavilion art and music festival. Sunday will be the same schedule. Then, all next week, I will do school by day, and Waxahachie by afternoon-evening, creating as many plein air watercolors as possible for the competition and sale to take place on the following weekend. 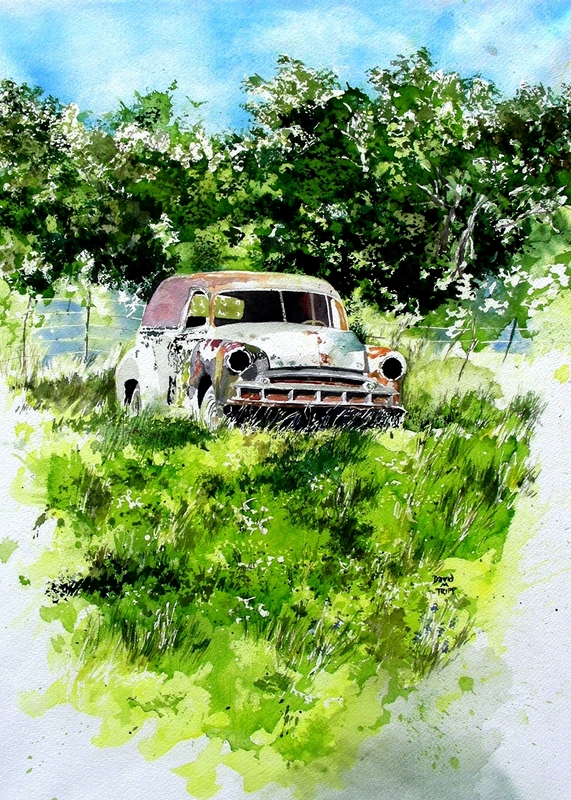 The posted watercolor is of a 1950 Chevy Sedan Delivery that I found in a field north of Hillsboro, along Highway 77. The owner proved to be a very gracious and accommodating man, inviting me onto his property to paint this vintage car along with several others he had lined up in his pasture. I was fascinated from the beginning with the layers of color and texture all over this vehicle, as well as the way the later afternoon light was playing off the wild grasses that surrounded it. I loved the stand of trees and fencing in the background as well. I believe this was my first watercolor that was larger than mid-size. It fills nearly an entire sheet of D’Arches cold-pressed 140-pound paper. This is my fourth painting of this subject, the first three being smaller, plein air sketches made in an attempt to “get it right.” I hope this original painting finds a good home some day. If not, then perhaps I will custom frame it and hang it in my own space. I do enjoy looking at it and remembering those idyllic late afternoons in that Hillsboro pasture, far away from the town. There was a real peace and solitude in the country that I seldom find in my working lifestyle. Thanks for reading. If you are local, I would love to see you at the Levitt, or in Waxahachie. It looks like we have a splendid holiday weekend approaching, for the enjoyment of the arts. No, this is not a painting of Andy Warhol’s Factory. This is actually a limited edition giclee that I am bringing out for the first time at this weekend’s art festival at Arlington’s Levitt Pavilion. My “factory” sentiment kicks in every time I get ready for an art festival. Andy Warhol regarded himself as a “commercial person” and “a machine,” and named his studio “The Factory.” It was located on the fifth floor of 231 East 47th Street (a former hat factory), and it served as his “Factory” from 1962-1968. In that space, he and his associates mass-produced his silk screen prints, cranking them out as if on an assembly line. My own factory is located in whatever designated room in my home or garage I use to spread out my stuff, and begin matting, shrinkwrapping, printing, pricing and labeling. I have been doing that every night this week, and will continue to do so until I leave for the festival Friday at noon. I actually enjoy the process, once I get into the groove. But so far, this week, I haven’t “grooved”! I’m usually pretty tired by the time I get home from school all day (the day always starts at 6:00), and this week, I can honestly say that the “muse winds” have not really kicked in. But–I still have 48 hours, so perhaps something will stir by then. I do enjoy the business side of art. I would rather be working on a painting, but this is a nice change of pace. 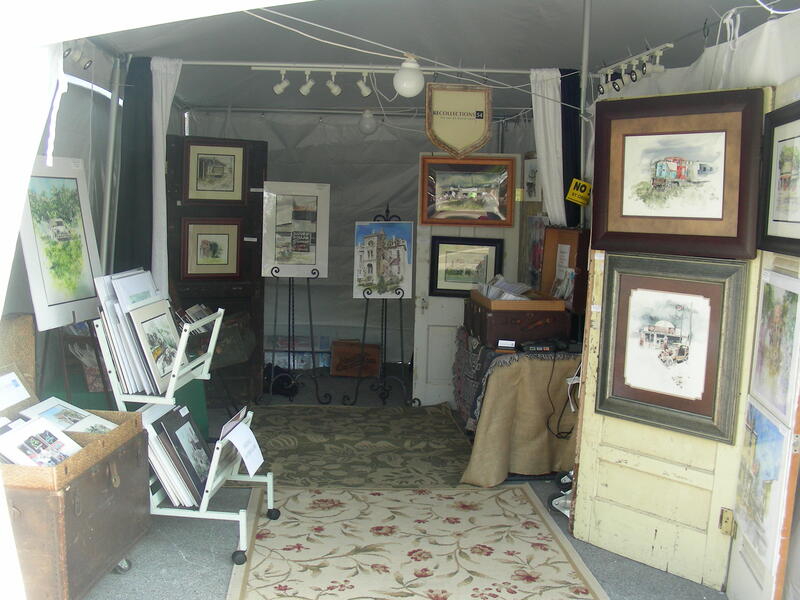 And I do enjoy meeting people once I’m set up at an art festival (and I like even more selling to the people!). There will be terrific music at this event, free to the public, with concerts featuring Michael Martin Murphey, Ray Wiley Hubbard and Asleep at the Wheel. Large crowds are expected, and I’m really looking forward to the event. 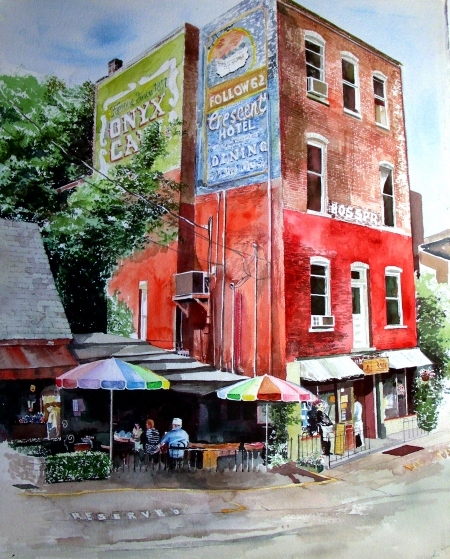 The painting posted is the heart of the historic district of Eureka Springs, Arkansas, where I will travel in a few weeks to teach a 5-day workshop on plein air painting in watercolor. 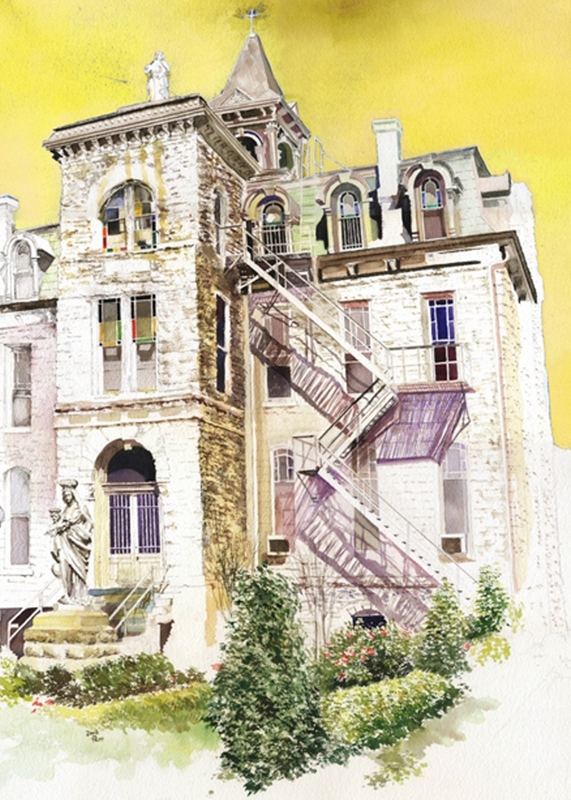 I take my students to the historic district and we take our pick of vintage architecture, flower beds, cliffs and any one of the myriad subjects presented to us in the open air. The experience has been very rewarding, and I am returning for my third consecutive summer. Well, I guess it’s back to the assembly line. It’s getting late already. 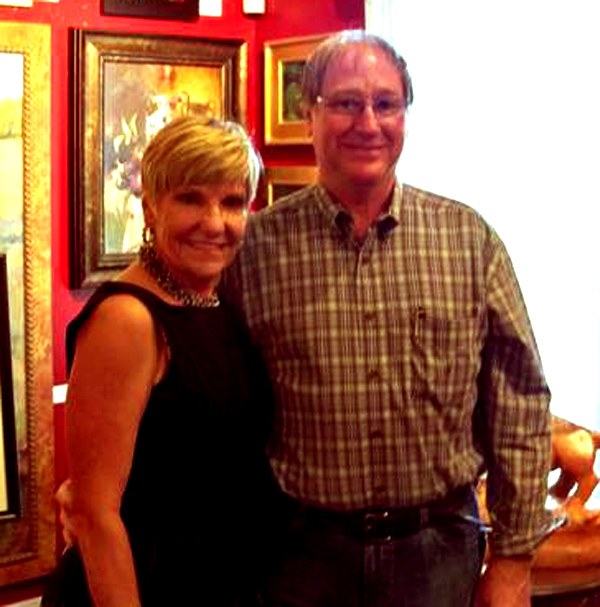 It was a pleasure meeting Fort Worth Mayor Betsy Price at the Weiler House Fine Art Gallery last weekend. She was featured at an Open House event, and visiting with her proved to be a genuine delight. She was expected only to put in a brief appearance, but the opposite proved to be the case–she stayed well beyond her scheduled time, talking with everyone, and never giving the impression of hurrying someone by, or that her attention was ever on anything aside from the one to whom she was engaged in conversation. I seldom see that demeanor among elected politicians. We were very impressed with her energy and approachability. I think everyone in the gallery experienced the pleasure of being photographed with her, after a good conversation. 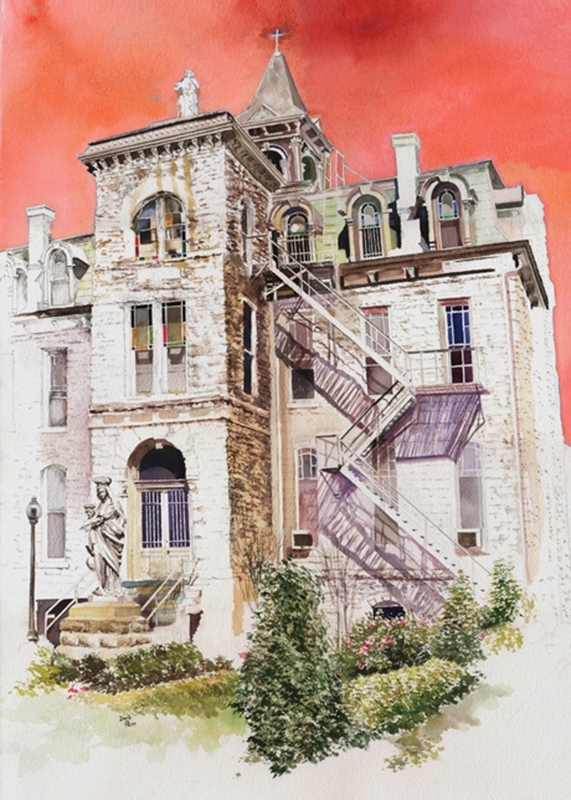 I just received my limited edition giclee prints of my recent watercolor of Saint Ignatius. The printer, a Photoshop veteran, decided to have some fun with variations on my print, and this is what resulted. I love the variations Andy Warhol did with his reproductions, and I find it amusing to know that he faithfully attended Catholic mass, (and I seem to recall that he visited his local parish frequently to pray in silence). At any rate, I wish to post these images. I will be bringing them into the public view during this holiday weekend at Arlington, Texas’s Levitt Pavilion for the Performing Arts. They are holding their first ever art festival, in conjunction with Friday through Sunday night concerts featuring Michael Martin Murphey, Ray Wiley Hubbard and Asleep at the Wheel. The event is 5:30-10:30 nightly, and is free to the public. I would love to see any of you there who can make it. I have been guaranteed a prime booth location. Here is the “Yellow Warhol” variation on my theme.
. . . and the “Sepia” look gives it a nice antique, vintage appearance (perhaps my personal favorite).
. . . and finally my orange version. I always laughed at the stories of Pablo Picasso working in his studio at 3 a.m. Long ago, I lost the ability to pull all-nighters. I miss them. But this could be a late one. I took a nap this evening (had a pretty miserable afternoon) and now am waking more as the hours roll by, and am getting lost in the rustic architecture of this Colorado mountain town. I recall it as vividly as if it were yesterday. Four of us were about to embark on a foolhardy trip over Tin Cup pass in a Jeep Grand Cherokee 4-wheel drive. We made the trip, but I still think the decision was foolish. I don’t bother to sport the bumper sticker “I Survived Tin Cup Pass”‘; I don’t take a lot of pride in doing that trip with a vehicle not quite cut out for it (Geez, 4-ply tires even! What a fool). I lingered around St. Elmo for quite a long time that afternoon, shooting my old 35mm camera, using Kodachrome slide film. I’m glad I saved the slides, though technology in the schools has all but made them obsolete. I don’t know how much longer this Kodak carousel projector is going to hold up. I took a break from painting to read a bit (I’m re-reading Basquiat by Phoebe Hoban), and to look at this work-in-progress on an easel across the room from my man cave. I like the habit of Andrew Wyeth, putting up his work so he could glance up at it while doing something else, or while entering a room, and thus get a snapshot impression of it to know what works, what doesn’t, and most of all, figure out when to quit the thing. I’m making myself stop right now because I’ve crawled into the painting to the point that I’m focusing on all these minute details and forgetting to see the entire work, compositionally. That’s how I lose a painting. There is a haunting soliloquy in the motion picture Six Degrees of Separation, where Donald Sutherland muses over how it feels to “lose a painting.” I have no words for this. But I regret those countless times when, signing a painting, I sighed and admitted to myself that it “looked better a week ago.” I pushed it too far. Right now, I have questions about this Colorado painting, and so I’ve decided to set it aside while I muse over it, and meanwhile, continue reading Basquiat. I tried to make today count, studio-wise. But it got intolerably hot in the man cave this afternoon. Now with the Texas night temperatures dropping, I find myself wishing for some of those St. Elmo, Colorado mountain temperatures right about now. Despite the bugs everywhere around me (they must really like these citronella Tiki torches), I am finding the opportunity to paint again. Posted is what I managed to do during the morning hours when it was cool and pleasant. I’m working overtime, trying to “fold” these buildings with better contrasts. There is a deep shadow between them. I’ve decided to render the one on the right in gold and the one on left (not in this picture yet) in brick red. 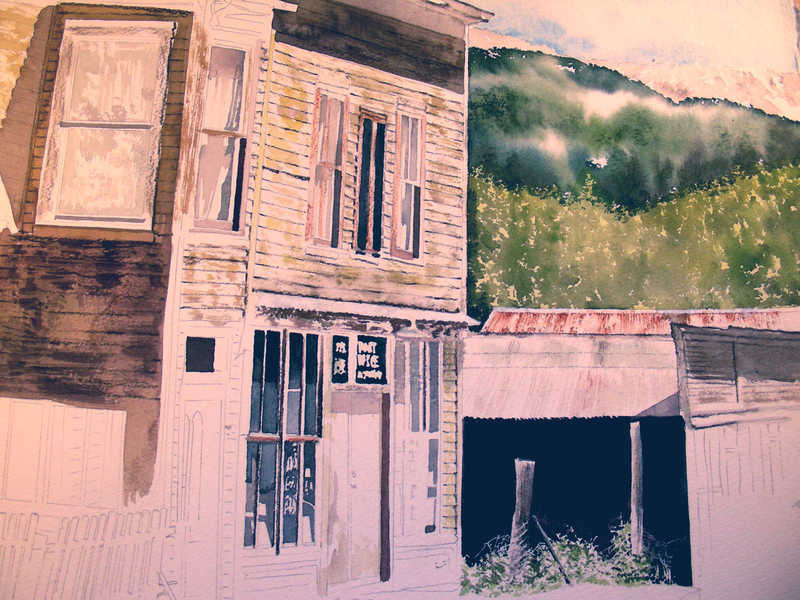 The siding is peeling badly, which is just what I like in watercolor rendering. I’m trying to use my brushes more as pencils, taking advantage of the cold-press texture of this paper, in capturing the blistered wooden surfaces of the buildings. I’m beginning to wonder if I’ll have this painting finished in time for the weekend show at Levitt Pavilion. That was not my design, but I’m surprised at how fast this one is shaping up. It is not as large as the ones I’ve done previously, this one measuring 16.5 x 22.5 inches. Thanks to an afternoon nap, I just may be able to stay with this one late into the night. We’ll see how it goes.